Doors will open 60 minutes before the start of each performance. Available from Saturday 14 February, 2004 at 10:00am. Akira, who runs marriage scams, is chased after by Army Surgeon Hanaoka and his colleagues, who are collecting “things that will disappear in the 20th century” by Imperial edict. When he ran away and came to the Tottori Sand Dunes, he meets deaf, blind and mute Heren Kera (a Japanese Helen Keller), who lives with a tutor, Saribaba. He is soon caught but becomes invisible man in an accident. However, he is visible to one person: Kera. The story of the play Tomei Ningen no Yuge (The Kiss of an Invisible Man) is overflowing with diverse motifs, including “Romeo and Juliet,” “The Miracle Worker,” the mythological world in the age of the gods, the River Styx and Hades. It develops further to cover World War II and the Imperial system, and together with skillful language play, a theatrical world unfolds in all directions. 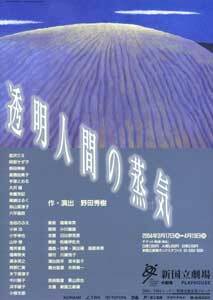 The play was first performed in 1991, when its writer Noda Hideki was with the theatre company Yume no Yuminsha, and could be described as the roots of his recent best works “Pandora no Kane (Pandora’s Bell)” and “Oil.” In the forthcoming production, the playwright himself will both direct and appear on stage. In the previous performance of his work “Gansaku: Sakura no Mori no Mankai no shitade (Imitative Version: Under the Cherry Trees in Full Bloom)” at the NNTT in 2001, rows of cherry trees in full bloom created a fantastic and gorgeous atmosphere on stage. In the upcoming production, sand dunes will stretch in the huge space of the NNTT’s Playhouse, where the story will unfold. Don’t miss a performance of “Tomei Ningen no Yuge” with its most promising cast.